One of the fastest creatures on Earth made special appearances at two Windsor elementary schools Monday, giving students a chance to see an endangered bird of prey up close and learn what they can do to protect it. Falon, a female peregrine falcon, and her handler Emma Stainton of the Canadian Peregrine Foundation (CPF), captivated audiences at Coronation and Talbot Trail public schools with presentations that highlighted the peregrine's impressive abilities. A peregrine falcon can dive at up to 300 km/h, three times the top running speed of a cheetah, the fastest land animal on the planet, Stainton said as Falon stretched out her wings on her companion's gloved hand in the Talbot Trail school library. Emma Stainton of the Canadian Peregrine Foundation holds six-year-old Falon at Coronation public school Monday. 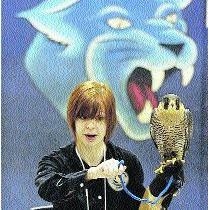 The educational program raises awareness of Ontario's endangered birds of prey. CPF has visited more than 4,000 schools across Ontario over the past two years, educating Grade 4 to Grade 7 students about the plight of endangered species. Project School Visit includes a video presentation about raptors, a discussion about ecosystems and conservation efforts and a meet-and-greet with a captive peregrine falcon, hawk or owl. "We're trying to educate the future generation about conservation and open the discussion to young kids," Stainton said. "(Students) are very interested and ask a lot of good questions." The peregrine falcon almost became extinct in the 1960s because of persistent chemical pesticides and industrial pollutants in its natural habitat. CPF is urging the Canadian government to "strongly protest" U.S. legislation that would legalize trapping and harvesting of native Canadian peregrine falcons as they migrate to the south. That makes Project School Visit an even more important supplement to the Ontario curriculum, Stainton said. CPF presentations continue today at Forest Glade public school between 9:30 and 11:15 a.m. and at Malborough public school between noon and 2:30 p.m. For more information, visit peregrine-foundation.ca.